When I made this resolution, I knew it might be hard to achieve. I wanted to leave it open, however, so the experience could be natural and as unrestricted as possible. Lo and behold, only a few short days after landing from Holland, I found myself in a part of the country I had never been before... Vieux Montreal! Even though I went for a conference, I knew the free time I had in the evenings was a rare opportunity. After a slow start to my tourism efforts, I found myself biking up Rue St. Laurent on a rented a Bixi bike, eating a smoked meat sandwich at the world-famous Montreal delicatessen, Schwartz's, indulging in maple ice cream on the streets of Vieux Montreal and gawking at Jean Paul Gaultier's punk-inspired creations at the Musée des Beaux Arts. 'Find adventure in unexpected places' might have been a better way to pinpoint resolution #5. 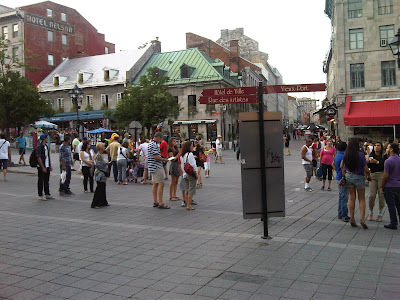 Being in Vieux Montreal was incredible, but what I learned from this resolution was to encourage myself to have an experience I would look back on with pride and glee. Because no matter how much my body needed rest, a bike through Vieux Montreal and seeing the Jean Paul Gaultier exhibit is simply a better report to bring back to my co-workers.